Facilities are available at the Town Hall. 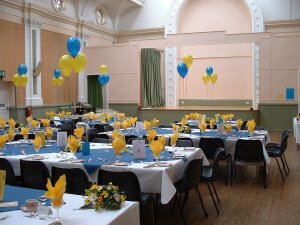 We have a large hall available with a stage and options of normal seating which can be arranged in a number of different formats with a capacity of up to 180 people. The venue also has a meeting room and a fully equipped kitchen. Please refer to the online enquiries form that can be found on the Town Hall Committee page of the website.